By the time the whale entered her third day of mourning, Dr Balcomb, said he had never observed a whale mourn for such a long time. A grieving mother orca, whose heartbreaking efforts to keep her dead calf's body afloat captivated much of the world, is now falling behind her group, sparking fears among researchers about her well-being. The 20-year-old whale has been carrying her dead calf through the water just off British Columbia for seven days, after it died last Tuesday shortly after being born. In the week since, the whale has been balancing the dead calf on her forehead or pushing it to the surface of the water. Experts at the Whale Museum on San Juan Island have been monitoring the whale, known as J35, since her calf died. Jenny Atkinson, the museum's executive director, said the orca was still carrying her dead calf on Monday afternoon. While the pod has been staying by her side, concerned researchers told the Seattle Times she’s now starting to fall behind the group. 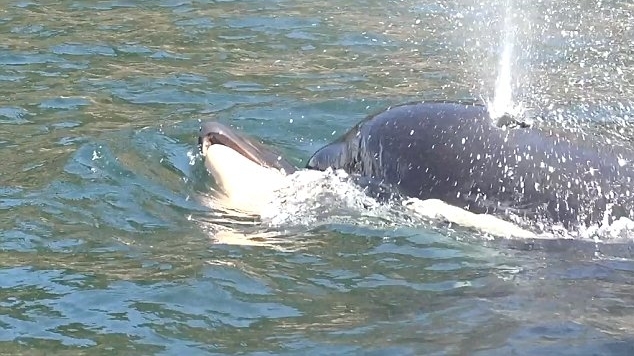 Ms Atkinson says the orca and her pod are going through 'a deep grieving process'. The Puget Sound calf was the first in three years to be born to the dwindling population of endangered southern resident killer whales. There are only 75 of the mammals left. 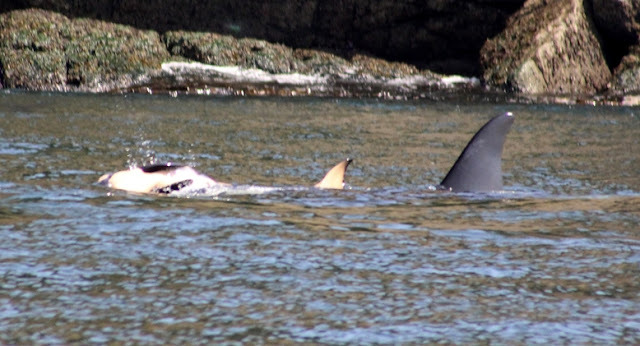 After the devastating loss of her calf, the mother was seen propping the dead newborn on her forehead and trying to keep it bobbing near the surface in the waters off the coast of Victoria, British Columbia. Earlier this year, a study by a non-profit organisation revealed whales and dolphins will hold 'vigils' for their dead. The animals will cling onto the lifeless bodies of their offspring for days and will try to keep them safe from predators. 'The baby was so newborn it didn't have blubber. It kept sinking, and the mother would raise it to the surface,' said Ken Balcomb, senior scientist with the Center for Whale Research on San Juan Island, which closely tracks individual whales. 'It is horrible. This is an animal that is a sentient being,' Deborah Giles, science and research director for the nonprofit Wild Orca, told the Seattle Times . '(The mother) is bonded to (the calf) and she doesn't want to let it go. It is that simple. She is grieving,' she added. Responses to "Grieving mother orca is still carrying her calf's body above the water (Seven days now)"
This has made me cry so much. Where is anyone to help her?